FROM ITALY WITH LOVE - Engineered from the toughest food grade materials and smoothly rolling components the Sfogliafacile MAXI manual dough roller machine is the one to get if you value impeccable precision, unrivaled speed and lifelong quality. Simply choose your thickness, from 0mm to 12mm, feed in your medium, turn the crank and watch as your Sfogliafacile MAXI rolls you out perfectly thick pasta, paste, pastries or fondant with zero human error. Takes the hassle, mess and wasted time out of hand blending food coloring by quickly, easily and flawlessly blending food coloring into your fondants, gum pastes and sugar pastes. Love to wow your guests, family or clients? Sfogliafacile MAXI rolls out the perfectly thin dough required for flower petals, delicate laces and beautiful volants. Extra-wide manual roller spans 60cm/24 inches (that’s 2 feet wide!) making it easy for you to roll out enough fondant to cover a large cake, or enough pasta to feed an army. [UPGRADED INSTRUCTIONS] - THE FINEST FROM ITALY: Superior quality food safe Sfogliafacile MAXI dough sheeter lends you the speed and laser-precision required to CREATE PROFESSIONAL BAKERY ARTS - without investing in a pricey electric fondant sheeter. NEW CRYSTAL-CLEAR ENGLISH quick start instructions ensure you experience beautiful results every time. ULTRA-THIN RIBBONS - PROFESSIONAL PRECISION: Simply feed, crank and watch as your pasta dough, fondant sheeting, gum paste, sugar paste, modelling chocolate, flaky pastry or short crust pastry flows out into window pane thin 0 mm to 12mm thick ribbon - plus CUT THE TIME it takes to perfectly blend food coloring into sugar paste while achieving flawless results. ADVANCED BAKERY ARTS - THE EASIEST, SMOOTHEST WAY TO create the ultra-thin dough you need for delicate flower petals, gorgeous lace, beautiful volant and any other themed decoration your customer desires. 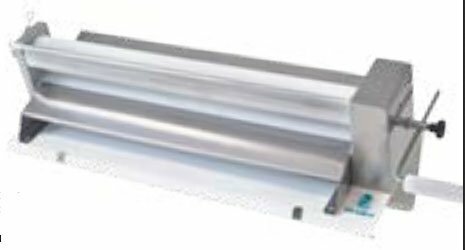 MAKE LARGER QUANTITIES FAST - EXTRA-WIDE MANUAL ROLLER: Sfogliafacile MAXI ½ inch roller spans a full 60 cm/24 inches wide so you can roll out everything from a large cake covering ribbon, an army feeding pasta feast, or enough pastry to supply your entire store. "WORTH EVERY PENNY! ", GUARANTEE - 20 YEARS IN BUSINESS MEANS we know how to take care of our customers and we'll do everything required to ensure your 100% satisfaction. We guarantee you'll say "It's Worth Every Penny Invested!" like our other professional bakers - or simply let us know within 30 days of receiving your Pastaline Sfogliafacile MAXI and we'll extend you a full, prompt refund - no questions asked. If you have any questions about this product by Pastaline, contact us by completing and submitting the form below. If you are looking for a specif part number, please include it with your message.